Looking for a way to get your company name and image out in the public in a manner that is absolutely positively huge? Hot Air Balloon Advertising can do tremendous things for brand image and name recognition. Hot Air Balloons themselves bring a positive image to the events they are at and to the people that see them. What advertising methods are currently being used by your company? Do people ever chase down a billboard to get a picture of it? Do television stations ever come to your event just because of the excitement the event itself generated? And if they do have you got a seven story tall advertisement with your company logo on it for them to televise? Can you imagine the excitement created when we have carried television cameras and personalities on flights for live broadcasts with a helicopter circling getting shots of the balloon, or had radio D.J. 's and personalities doing live shows from the balloon. The unique thing is that this is not purchased air time. The balloon itself creates the excitement and the advertising generated is invaluable but can't be purchased. Fly Ohio Ballooning has had commercial balloons on all of the local television stations in the Central Ohio area and we have gotten lots of color photos in many area newspapers and magazines without paying a dime in advertising. We have done live television and radio broadcasts from commercial balloons and every time the commercial balloon received tremendous coverage. 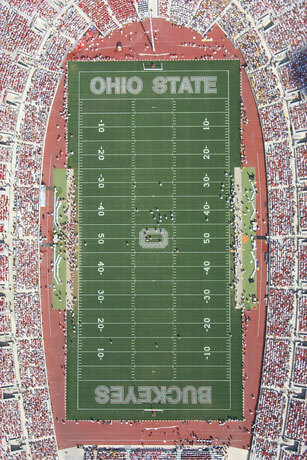 2002 Ohio State home game. Who are these companies that see that Hot Air Balloon Advertising with Fly Ohio Ballooning can take a company name and image to new heights? We have worked with everything from large national companies such as Kroger doing advertising in many states to local companies like Swan Cleaners, Franklin University, and The Performance Columbus Family of Dealerships, including Honda Marysville. We can design an advertising program tailored specifically to suit your needs. 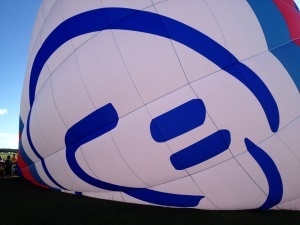 With Hot Air Balloon Advertising with Fly Ohio Ballooning the sky really is the limit. © 2019 - Fly Ohio Ballooning - All rights reserved.